Based in the seaside resort of Prestatyn in the Welsh county of Denbighshire, Prestatyn Town Football Club has been in existence since 1910. Nicknamed The Seasiders because of the club’s location not far from the Prestatyn beach and promenade, the side has enjoyed a long, though not always illustrious, life in the lower divisions of Welsh football. That’s not to suggest that they have never enjoyed any success, of course. In 2013 they beat Bangor City 3-1 after extra-time in the Welsh Cup, lifting the trophy for the first time in the club’s history. That victory meant that the were eligible to enter the second qualifying round of the UEFA Europa League. The majority of the club’s existence has been something of a mixed bag, with highs as well as lows for their supporters to both celebrate and commiserate over. An undeveloped field on Marine Road in Prestatyn could be called the club’s first ‘ground’, with records suggesting that games were played there as long ago as the 1890s. After that they moved from field to field, football pitch to football pitch. There is some debate as to whether any of the sides that played those games are linked to the modern day Prestatyn Football Club, with a number of them folding after only a couple of seasons in existence. What we can say with certainty is that the club won the North Wales Coast FA Junior Cup in the 1928-1929 season, the first piece of silverware of its existence. Back then the manager was a man called Sam Bennett, but managing wasn’t all he did. He was also the head of the football club’s committee, trainer of the players and also wrote match reports, which he gave to the local newspapers. He was even known to act as the linesman for games on more than a few occasions! During the 1940s the club played under the name of Chandypore FC, but this didn’t last long. With the exception of a stint playing with the sponsored name of Prestatyn Town Nova in 1990, they have remained simply Prestatyn Town Football Club for the majority of their years of playing football. Apart from that FA Junior Cup at the end of the 1920s, however, success had been difficult for the club to come by regardless of what they called themselves. In fact, their next taste of success didn’t come about until the end of the 1971-1972 season when they won the Dyserth Area League. Having had the taste for success, they didn’t want to relent and won the same thing in the 1972-1973 and 1973-1974 seasons. At that point the Dyserth Area League was merged together with the Halkyn Mountain League to create the Vale of Clwyd and Conwy Football League, otherwise known as the Clwyd Premier League. Prestatyn Town didn’t let the added competition that came with the new league stop their run of success, however. They did a league and cup double in 1974-1975, winning their division and the Clwyd Premier Cup. The following year they repeated the trick, though that was their last silverware until the won the Clwyd Premier Cup again in 1982. Throughout the 1980s and 1990s The Seasiders won occasional trophies to keep the fans interested, such as the Clwyd President’s Cup in 1984 and the REM Jones Cup in 1995. Yet ahead of the 1998-1999 season it seemed as it disaster was going to cause trouble in Prestatyn. 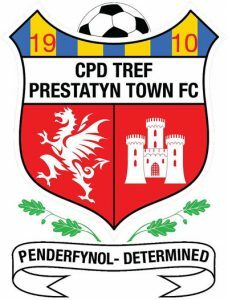 There was a split within the club that saw Prestatyn Town resign from the Welsh Alliance and a new club, Prestatyn Nova, forming. If people had been expecting Town to fall apart they were in for a shock; The Seasiders went on to win a Clwyd League, Premier Cup and President’s Cup treble! 2016-2017 saw Prestatyn Town once again win the Cymru Alliance League title and gain promotion to the Welsh Premier League. Not a bad achievement considering a number of the club’s best players left in the wake of that 2013 Welsh Cup and NWCFA Challenge Cup double. It also made their progress in the UEFA Europa League more impressive that they managed to achieve it without a number of the players that got them there. Having lost the first-leg of the Europa League Second Qualifying Round 2-1 to Liepājas Metalurgs in Wales, Prestatyn Town then travelled to Latvia and won 2-1 out there, taking the game to extra-time and, eventually, penalties. They won the penalty shoot-out 4-3, progressing to the Third Qualifying Round where they took on Hrvatski Nogometni Klub Rijeka. Sadly that was where the dream ended, losing the home tie 3-0 and the away tie 5-0, going out 8-0 on aggregate and missing out on the opportunity to play in the Europa League group stage. Earlier we mentioned that the club bounced around from location to location during its formative years. This remained the case until the 1930s when it settled in a spot just behind what is now the Central Beach Club. This was the old Bastion Road and Prestatyn Town remained there until the land was sold to be redeveloped at the end of the 1960s. At that point they moved to their current ground, also known as Bastion Road. Sometimes called Bastion Gardens, the football ground wasn’t exactly the most developed in the Welsh leagues. In fact, the only building that existed on-site was the one that housed the changing rooms. Additions were made to the facilities throughout the 1970s, 1980s and 1990s, with the mid-part of the 1990s seeing the addition of old bus shelters to allow the place to feel slightly more enclosed. 1995 was the year when some of the most significant changes took place, as the club took a loan from Prestatyn Town Council in order to add in-house bar facilities to the ground. Manchester United sent an XI to play in a friendly game to celebrate the opening of the bar, beating the hosts 5-0. Nowadays the ground has enough room for 2,300 spectators, 200 of which are lucky enough to get a seat. Though The Seasiders have enjoyed some great success, it would be an exaggeration to suggest that they regularly sell-out their games.